There are a lot of Parkinson's fitness programs out there, including Rock Steady Boxing, and there are a lot of reasons why I love them. This isn't a post about why you shouldn't be doing a group fitness class. Instead, we'll walk through 3 questions to ask yourself about the group fitness classes you're taking in order to identify where there may be gaps that you need to be aware of. If your only source of exercise is a group fitness class, you may not be reaching your full potential when it comes to your exercise program and you're doing yourself, your brain, and your future a really big disservice. So, let's walk through three questions to ask about the group fitness class that you're in to see where you can improve. Question #1: Are there classes for people at different levels? 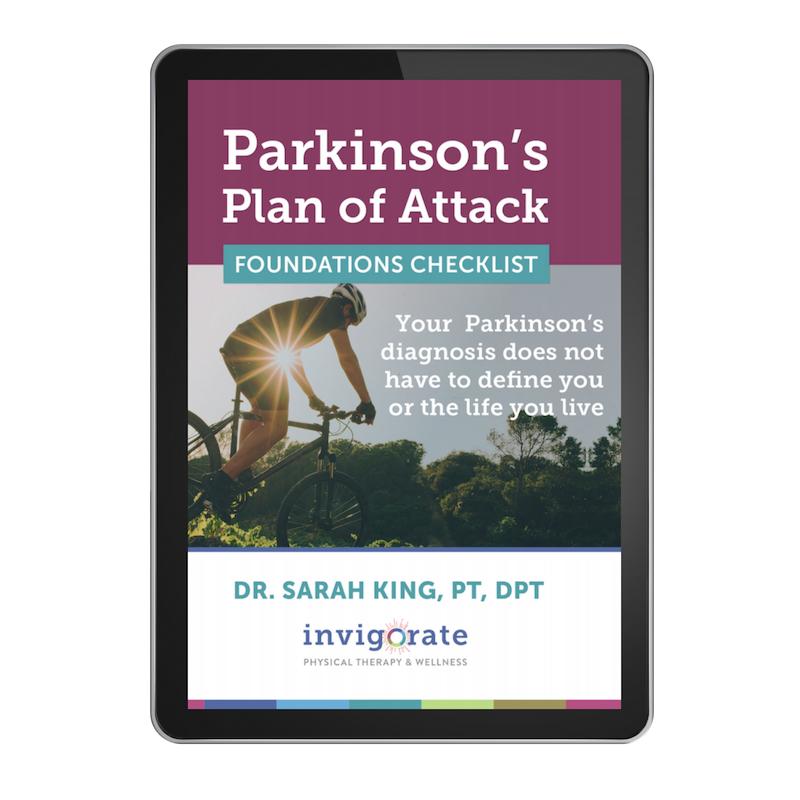 The reason why Parkinson's fitness classes should have different levels is because Parkinson's is a disease that has five distinct stages. Now, not everyone goes through all five stages, but it is important to be aware that someone in stage one Parkinson's is much different than someone in the fifth stage of Parkinson's. It's not really that important to get wrapped up in what stage you're in, but the exercise class you're in should have a group of individuals who are at your level because if you can't be challenged to the peak of your abilities then you can't be making as much progress as possible. For example, if you're going to a class and you're symptoms are mild to moderate, but you're in a class of people who are not able to stand and the instructor is tailoring their class to the average, you may not be getting the best workout possible. In contrast, if you are someone who can't stand, and you're in a class where there are a lot of people who can stand, and the instructor is trying to do half the class tailored towards the people standing, and half the class tailored to people who are sitting, then you're not getting the highest benefit. Having an occasional group class where you're participating as a community, and everyone from every stage and walk of life is there can be really really motivating and amazing. However, I would also encourage you to make sure that you're working with a personal trainer or a Parkinson's physical therapist, individually, so a part of your overall exercise program includes someone taking you to the peak of your ability because that's really where your brain changes. Question #2: How much supervision are you getting? Supervision and feedback is critical for potent results! This is really important if you are someone who is at a high risk of falling or you have have freezing. When you're in a large group class, and you have a really impaired balance, freezing issues, or are generally unsteady, the supervision level in a group class isn't going to be high enough to where someone can take you and push you to your highest challenge point. You need to be working with someone 1-on-1 so when you're doing things that are really challenging your balance, someone is right there to make sure that you don't hit the floor. If you are having freezing or you are at high risk of falls, then it's really important to seek out a Parkinson's physical therapist to work with one on one so that they can, again, push you to that higher level of challenge so that you can get your best results. Question #3: Can they tailor the exercise program to your specific needs? Celebrating our group's hard work! If you have some type of injury where you need modifications to exercises (potentially a long-lasting rotator cuff tear, a herniated disk in your back, or a knee replacement that's still healing) typically, in a group setting, no one can tailor the program specifically to your needs. Some group fitness instructors are really amazing. Say you have shoulder pain. They may be able to give you some modifications to avoid push ups, for example, or to avoid certain movements with your arms. However, because of the nature of the group fitness class, they can't be by your side all the time, checking your form and making sure that you're really not going to hurt yourself or reinjure an old injury. So, if you have the need for a lot of modifications to your exercise program, to the point where in a group class you find yourself raising your hand with everything, and saying, "that hurts", or "this isn't working for me. I can't move that way", then it may be better for you to fill in a couple of days a week working with a Parkinson's physical therapist who can give you modifications and tailor a program to you so that when you do go back to that class, you know exactly what to do and how to do it safely. Remember: If it hurts, STOP. If it's hard, KEEP GOING. There is no such thing as "no pain, no gain" when it comes to Parkinson's exercise. Alright, so just to reiterate, I am not discouraging you from doing Rock Steady Boxing or any other Parkinson's group fitness class. I love group fitness! Keep going so long as it's really working for you. I hope this gave you a bit of guidance on how to identify when and where you may need to fill in the gaps that a group exercise class is leaving open, so you can supplement a couple of days a week with a Parkinson's trainer or a Parkinson's physical therapist to really give you the most bang for your exercise buck. If you're a fighter, you can tell me all about how you love Rock Steady Boxing down below. If you are doing any other group fitness class for Parkinson's I'd love to hear about it, too! Please put your comments in the comments section below this post and be sure to share it with anyone you think may benefit!